You should not keep Jazz Spot installed on your system because it belongs to the category of advertising-supported applications, and it might really act in an undesirable way. To be honest, it seems that this application will not do anything useful at all even though it says that it will improve the browsing experience. We have not managed to find out information about this software on its official web page as well, so it is unclear for many users how it is going to act. Of course, there is no doubt that this ad-supported program will show ads like other similar applications (e.g. Roaming Rate, Dragon Branch, Record Page, Glass Bottle, and On Stage). It is not worth keeping an application that does not do anything but show commercial advertisements. Unfortunately, some users find it rather hard to get rid of Jazz Spot even though it is possible to erase it via Control Panel. If you are one of those users, you should definitely read through this article and then use our manual removal instructions or erase this adware automatically. There is no doubt that Jazz Spot is installed on the system if you can find its folder Jazz Spot in %PROGRAMFILES% or %PROGRAMFILES(x86)%. In most cases, this folder contains such files as 7za.exe, Uninstaller.exe, and firefox@www.jazzspot.net.xpi. The application not only creates its folder in C:\Program Files (C:\Program Files(x86)), but also puts its registry keys into the system registry. Finally, it creates a bunch of CLSID keys in order to work as it should. If you remove any of its files or remove a registry key it creates, it is very likely that it will not be able to work properly. Of course, it does not mean that it cannot cause harm to your PC anymore. Therefore, we suggest getting rid of undesirable software fully. Nobody can tell you exactly why this program connects to these servers; however, there is basically no doubt that this adware can get updates and become much more harmful. These advertisements usually lead to third-party web pages because they mainly advertise products and services developed by other companies. Unfortunately, nobody can guarantee that you will not end up on an untrustworthy web page. If you want to be sure that your system is safe, you should delete Jazz Spot ASAP. The official web page of Jazz Spot is hosted on 23.59.190.121 IP, which shows that its origin its Washington, Seattle. It can be suggested that this adware program is aimed at people living in the USA primarily; however, we are sure that it might infect your PC even if you live on the other side of the world too. This might happen because this ad-supported program is distributed in software bundles. 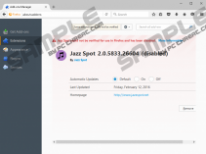 Nobody knows the exact names of the programs that travel together with Jazz Spot; however, we are sure that it can come in a bundle with adware, potentially unwanted programs, browser hijackers, and other infections. If you find an unknown program on your computer as well, you should definitely check whether or not it is reliable. In case it turns out that it is really untrustworthy, you should eliminate it from the system as soon as possible. If you cannot do that yourself, a trustworthy automatic malware remover will definitely help you with that. As you already know, it would be wise to remove Jazz Spot to protect the system from harm and other malicious applications that might enter your system if you keep this adware on board. Luckily, it is quite easy to remove this program from the system. Just use instructions which can be found below this article. Another thing that you can do to erase this undesirable program is to scan the system with an automatic malware remover. There are so many tools published, but, unfortunately, not all of them are trustworthy. Therefore, we suggest using SpyHunter if you decide to eliminate adware automatically. Find and select the untrustworthy program. Quick & tested solution for Jazz Spot removal.